This 3-1/2" x 5-1/2" card features not one, but three different Sale-a-bration products that you can get for free when you order $50 or more during Sale-a-bration. I made this card for our group's Sale-a-bration swap. I love that we organize swaps whenever a new catalog is released. I can do the work of designing and making one card and then end up with a bunch of different cards to show off new products to my customers. We also swap at our monthly meetings. Wanna swap with us? Join my team and participate in our next swap! bold = Get it FREE during Sale-a-bration with a $50 order! Sale-a-Bration: Get a free gift for every $50 order; plus bonus gifts for orders over $150 and $400! Pocket Full of Sketches: Layouts and Card Ideas to inspire your stamping creativity; Order your copy today! Did you see my post earlier with the Stampin' Success article about dying embellishments? Here's another way to dye the new Flower Trim from Stampin' Up! -- use a Stampin' Write Marker! I love the look of just coloring the edges of the flower "petals". It's easy to achieve by simply brushing your marker tip over the flower. Use a Paper Piercer or Paper Snips to hold the flower in place as you color with the marker. This is one of the cards in my Stamp of the Month Club series for January. I had so much fun designing these cards with the brand new Spring Catalog products. Can you spot all of the new goodies I used on this card? When you sign up my Stamp of the Month Club, you'll get a new Clear Mount stamp set and three, completely finished stamped cards each month! Click here to learn more and sign up for this club. Join now and get the January package. 1 buck, 1 buck, not for a Million bucks, 1 buck! From now until February 12 (or while supplies last) you can get your hands on any of these content discs for just $1. That's not a typo--they're just one buck. So indulge--it won't break the bank! Click here to Shop Now in my Online Clearance Rack. Each disc includes exclusive digital content from Stampin' Up! : digital stamp sets, designer paper, embellishments, photobook templates, and more -- most of which can be used with ANY design program, not just My Digital Studio! The DVDs retail for up to $39.95, so at just $1, you'll save up to 98%. WOW!! Have you tried MDS2 yet? Download the 30-Day Free Trail from my Online Store Now. 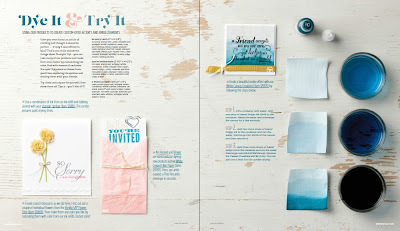 One of my favorite perks of being a demonstrator is the bimonthly Stampin' Success magazine, filled with project ideas, business ideas, advice, and recognition for demonstrators. I always learn something new and find ideas to copy and share with my customers. Want to take a peek at the most recent issue? Click here to check out a few pages, including the pages pictured about detailing several dying techniques. It's time to rewind! I looked over my posts from last January and choose my top 5 favorite projects to share with you again. Click on each photo for more details about the project. Don't miss out! Some of my favorite products from last winter (featured on these projects) are now available in the Clearance Rack at deep discounts! Only while supplies last! Shop Now. There are 19 free gifts to choose from during the Stampin' Up! Sale-a-bration promotion. Which one is your favorite? I truly can't decide. I love that they are all so different! Vintage Verses is definitely at the top of my list. On this card, I used it with Feeling Sentimental stamp set, also a Sale-a-bration gift choice. I stamped the phone booth in Jet Black Staz-On Ink and then used Real Red ink and an Aquapainter to watercolor in the lines. bold = Get it FREE during Sale-a-bration! Whoops! I'm little behind in posting winners from my monthly Free Stamp Set giveaway! Congratulations to Debbie Russo and Melinda DeRouin for winning the drawings in November and December respectively. You will each receive the Cherry on Top stamp set. It's a new month, and time for a new free stamp set giveaway! Each month, I will give away a free stamp set. To be eligible for the drawing, all you have to do it place an online order (email orders count too!) that is not part of a club or workshop. You'll get one entry for each order that you place with me between January 1-31 for the first drawing and February 1-28 for the second drawing. I'll draw winners in March for both months. The new stamp set up for grabs is Million-Dollar Moments, a hostess set from the Spring Catalog. You can also earn this stamp set for free when you host a party or place an order over $150! These Valentine treats come together quickly with the Scallop Envelope die and laser-cut More Amore hearts! Remember the Christmas Scallop Envelope Treat I posted in December? I dressed up this version for Valentine's Day using products from the new Stampin' Up! Spring Catalog. This was one of the projects we made in Stamp Club this month. The new Designer Builder Brads are so pretty! And very easy to use! We stamped the heart from Itty Bitties and punched it out with the circle punch from the Itty Bitty Shape Punch Pack. A Mini Glue dot holds it on the brad and then we placed the clear "bubble" over it. This favor box may not be big enough for a cupcake, but it's the perfect size for some candy or a small gift! The sanded chevron-embossed Core'dinations cardstock adds just the right texture to this clean and simple box. The Fancy Favor Box is cut with the Big Shot, and assembly requires just a few pieces of Sticky Strip. It's fast and easy! That's my kind of project! I am so excited to offer a new series of exclusive project files: 6 Weeks of Sale-a-Bration! Starting Sunday, I'll be sending exclusive tutorials each week with a new idea featuring a different Sale-a-bration product to inspire your paper crafting. These free tutorials are only available to my email subscribers! Not getting my newsletters yet? Subscribe now so you don't miss a thing! You'll also get my monthly newsletter with a featured tutorial, project ideas, tips, and information about upcoming events and promotions. Sign up now! Pop Quiz: Can you spot all the new Sale-a-bration products I used on this card? Do you see them all? The obvious one is the Sycamore Street Designer Paper. I think this pattern is my favorite! And the "Just Because" is part of the Vintage Verses stamp set. The Rich Razzleberry Button is part of the Sycamore Street Ribbon & Button Pack. And did you catch the little bit of embossing on the right side? I used the Vine Street Embossing Folder to add some texture and balance out the card. 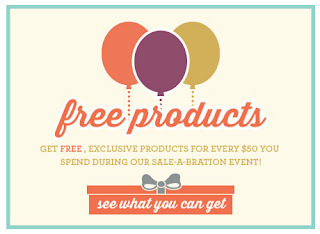 During Sale-a-bration, you can get ALL of those products for FREE! One for every $50 that you order. Click here to shop in my Online Stampin' Up! Store now! Note: The card size is 3" x 5-1/2". I used a leftover piece of cardstock and folded it in half. It's okay that the flower sticks over the edge of the card because it will still fit in a regular Medium size envelope. Get one free gift for ever $50 in merchandise that you order. No limit! Click here to view the Sale-a-bration Gift Options. Shop Online Now. Add your merchandise to the Shopping Cart and then choose your free gift selections when your check out. Host a party or private class and get a FREE package of Silver Glimmer Paper with your party sales are over $150. Invite more friends and if you get up to $400 or more, you'll get a FREE Sycamore Street Product Bundle (Designer Paper, Stamp Set, Ribbon, & Buttons) from the Sale-a-bration Gift Options. Long distance stampers -- ask me how to "Party By Mail"